Promoting the continuous improvement of the Quality Management System, through the setting and achievement of quality targets. In October 2017, Sinalcabo successfully transitioned its QMS to the new reference standard NP EN ISO 9001:2015, thus continuing to improve its internal processes. 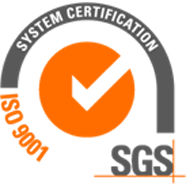 The QMS Certificate and the corresponding Quality Management System Policy are available HERE and HERE﻿.